A wakeboarding festival in the middle of Wales with a predominantly teenage audience isn't a natural fit for bands from the last century. However, James and Echo and the Bunnymen prove there's no substitute for great tunes. First things first, I have no idea what wakeboarding is. Still don't. And there probably wasn't much of it going on in the main festival site. Wakestock is a very young festival and the majority of the audience probably weren't born at the time both James and the Bunnymen were in their prime or even bothering the lower regions of the singles charts, so it's quite an interesting line up. The set up is unusual too, with both stages next to each other in the same tent so we go from the Bunnymen, to Wretch three two (not thirty-two, it's important) to James to Rudimental. It's a strange contrast, but actually what you learn is that there's no substitute for great tunes. The difference is that the Bunnymen and James just rely on those tunes yet Wretch 32 and Rudimental have great tunes, they just choose to ruin them by having some bloke shouting "bounce bounce" or that someone "has given their all, give it up for them" over the top of them. We're not sure if it's the hot weather or the dark tent fitting in well with his ubiquitous shades, but McCulloch seems in a good mood. Maybe it's the surprisingly positive response the Bunnymen get given the average age of the audience. It shouldn't be a surprise though. Even given the rumoured fractions within the band, they still have a back catalogue that puts most bands to shame and we get a smattering of their finest moments from The Cutter to The Killing Moon and the response they get shows that they've either won the kids over or there's still hope for proper guitar music and it's the business that's trying to put the nail in the coffin of it, not the audience. We're treated to Wretch Three Two (get it right) who are actually quite entertaining over on the other stage when you ignore the rubbish attempts at crowd interaction and focus on their tunes before James make it to the stage for their headline set. Headline set being an hour in Wakestock terms. It's actually a wonderfully organised festival with some excellent food stalls, very well laid out bars and toilets, it's just slightly misleading on what you get from a headliner and the frankly taking the piss £20 charge for parking. Anyway, James open up with Sound. A kid next to me moans they're not playing hits. To be fair to him he knows most of the songs; to be unfair, he doesn't realise this is their second most successful single. James are at that awkward moment where they've not released anything for nearly three years and therefore don't have "current" material that people know so there's an expectation of the hits and they deliver on that without this just being a roll out of the obvious songs. Ring The Bells is a fierce fiery call to arms that has the kids singing back the chorus even though it was recorded before most of them were born. Next up is the first of two new songs called Curse Curse. It was premiered at Thetford a month ago and this is its second outing. It has all the hallmarks of a great James song, but it does demonstrate the risks that James take in showing songs to their public before they're laid down and finished. They're in the middle of recording a new album for release early next year and this already feels like one of the key songs. The chorus is done and will become a classic singalong, however the verses still sound like a work in progress lyrically as they're very different from the version at Thetford (which actually sounded pretty much done). You can't imagine, and they haven't, The Stone Roses braving a new song live before it's been fully nailed down in the studio. The great thing is though that there's still bands out there not afraid to take risks with new material rather than just resting back on their laurels. However, you can't not go back to the back catalogue, especially at festival shows like this. Come Home has Tim out in the crowd on the barrier and the outstretched arms trying to grab him are those of kids younger than his own - showing how great music can break down those barriers of what you're supposed to like and what's cool to like. They do then go a little self-indulgent in that we don't get a run of hits, but the as-yet-unreleased-in-studio-form-but-over-thirty-years-old Stutter, which ends with a three drum onslaught and Tim singing whilst playing keyboards as Saul smashes Larry's guitar with drumsticks as strobes flash around the tent. It drops into the more gentle soothing Out To Get You which finishes with a magnificent violin solo from Saul. They finish with a run of four singles (or future singles). Getting Away With It (All Messed Up) has sort of become a James anthem and encapsulates the ethos of the band. It only hit the mid-twenties in the charts when Universal half-heartedly promoted the final pre-split album Pleased To Meet You, but it became a fan favourite. Moving On is likely to be the next single early next year and is the most accessible thing they've written since the reunion, if only radio, other than a few long-term supporters like Geoff Lloyd and Pete Mitchell, would actually play a new James song. They finish with two songs that get the crowd bouncing as much as they do for Wretch 32 and the surprisingly good (when you discount the bloke shouting bounce bounce) Rudimental. Sit Down is a call to arms and a song of unity that crosses the generation gap - there's a point where two young girls on the shoulders of their friends hug each other as Tim sings "those who find themselves ridiculous" that feels like age and being cool no longer matters. Laid, with Tim bouncing up and down on a monitor, has the whole place singing along to the first verse before Tim starts singing it. You have to hope that the rather surreal line-up actually serves its purpose and someone somewhere had a master plan to introduce the youth of today to bands that are still as relevant today as they were years ago if only they were given the respect and coverage they deserve. James and the Bunnymen are a perfect introduction. James official website can be found here and David Brown's unofficial tribute site here. 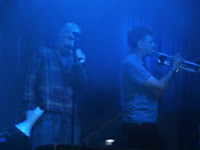 James are on Facebook and Tim Booth and Larry Gott on twitter. 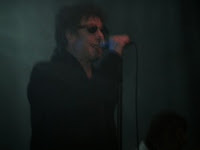 Echo And The Bunnymen's official site can be found here. They are also on Facebook and Twitter.